434 p., 17,8 x 24,5 cm. The message of this book is that Hobbes, and not Descartes, was the first to develop a specifically modern philosophy. The manifestion of modern subjectivity in Hobbes’s work is expressed for the first time in a systematic development from perception up to political action. The author shows how, based on a mechanistic ontology and natural philosophy, Hobbes tried in vain to develop a human self-understanding and how this yielded an epistemological skepticism whose outcome for political philosophy was political absolutism. This thesis is a systematic reconstruction of Hobbes’ work. It focuses on the relation between his mechanistic ontology and the manifestation of modern subjectivity in his philosophy. Hobbes wants to elaborate a self-conception of man within the new mechanistic paradigm which enables physics to be a successful science of the world. That is why he admits feelings, perceptions, thoughts and intentions as phenomena of self-experience and applies the mechanistic paradigm to them. Paradoxically enough, this very application is shown to make man emerge as a subject in contrast to nature as an object in Hobbes’ work. Although the theory of this subjectivity cannot be deduced from the materialistic ontology, the way Hobbes considers this subjectivity depends on this ontology. Nevertheless, Hobbes fails to establish this subjectivity within the mechanistic order of the world. Hence reflecting on Hobbes’ theory as a product of this subjectivity results in scepticism: Each person has his or her own private reason. No proposition can claim an objective validity. This book reveals these sceptical consequences in Hobbes’ theory of knowledge. His theory of unrestricted sovereignty is shown to be the political consequence of this epistemological scepticism. In contrast to common belief, the results of the book culminate in the thesis that it is Hobbes (not Descartes) to have worked out an entirely modern philosophy for the first time: He considers reason and subjectivity to be eo ipso active. This feature of his theory is a landmark to modern philosophy. 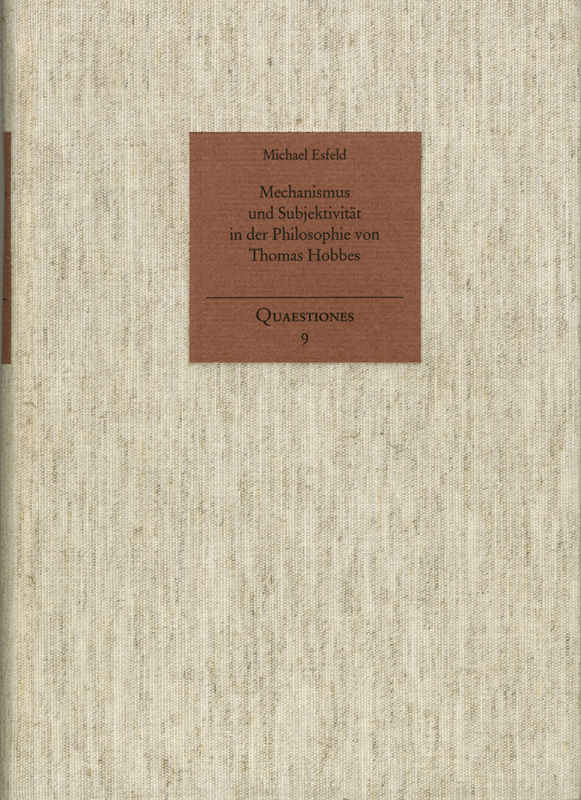 This book shows that the seperation between subject and object, mind and nature cannot be traced back to the admission of classical metaphysical conceptions in modern philosophy of mind: In Hobbes’ philosophy, the mechanistic paradigm immanently gives rise to this separation – just because Hobbes wants to develop a self-conception for man within this paradigm. Bettina Wahrig-Schmidt, Stud. Hist. Phil. Sci. The author has performed an extensive and thorough reading of the published works of Thomas Hobbes, and I am really impressed at how he consequently develops his own interpretation of Hobbes [...] Esfeld has produced an original interpretation of Hobbes’ works and a highly sophisticated piece of systematic philosophy.